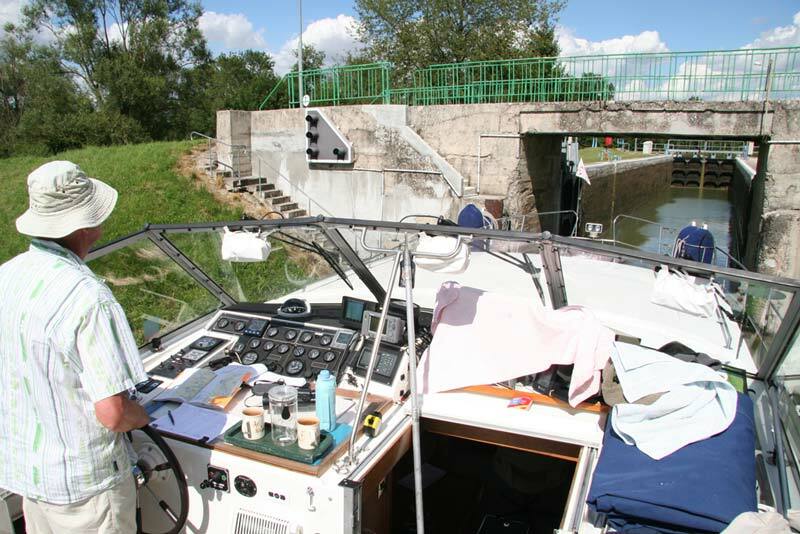 It is now two months since we cruised off from Limehouse and started our unplanned cruise of the French canals. Our relaxed approach has worked quite well, except that we now find ourselves in the middle of France when we are really quite ready to go home. Having decided on a scheme to take the boat to the Netherlands, ready for more cruising there next year, we are faced with a rather arduous last two weeks through the forest of the Ardennes, across Belgium, before reaching the Dutch border south of Maastricht and looking for the first convenient stopping point. The weather turned conveniently fine today and allowed us to put in a full day's cruising, starting off in the morning rush hour at 8am and only stopping when the locks closed at 6pm. 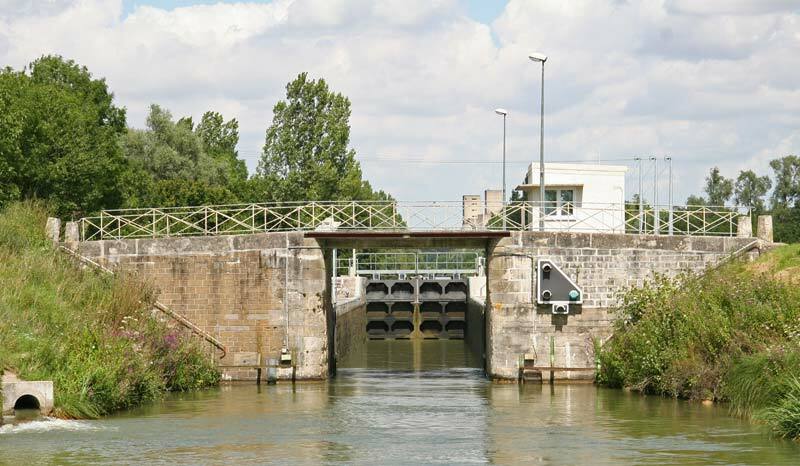 This was a day full of locks - going down from Reims on the Canal de l'Aisne à la Marne to its junction with the Canal latéral de l'Aisne, then turning east and climbing up this waterway as it changed its name to the Canal des Ardennes. All the locks are automatically operated, but the VNF staff are never far away in case of problems, which seem quite frequent. There is little barge traffic on these waterways, although the number of disused silos and commercial quays are testament to a busier period in the waterways' history. We feared for the future of some of these navigations, which will need more than the occasional leisure license fee to pay for the necessary maintenance. 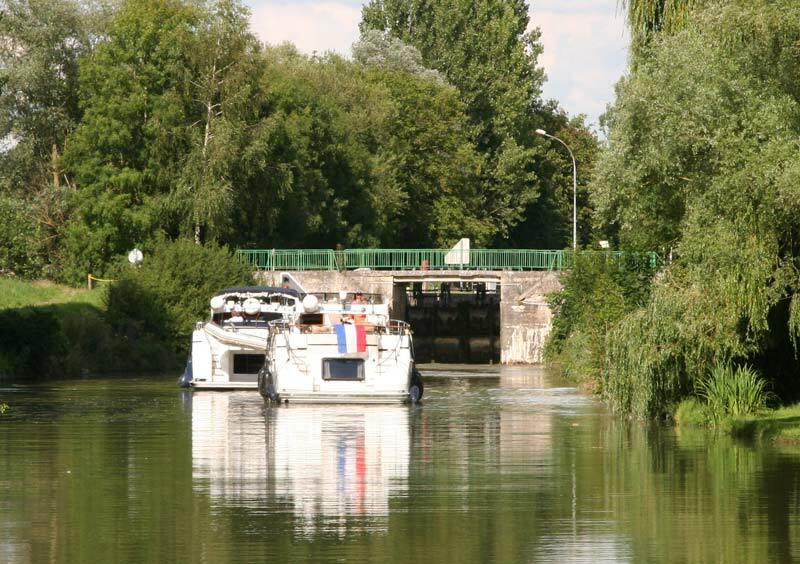 We had planned to stop at the town of Rethel, famous for its boudin blanc (white pudding), but we were stopped in our tracks by the 6pm closing time of the locks, and so concocted a bankside mooring downstream of the Nanteuil lock, at the tiny hamlet of Nanteuil-sur-Aisne. Depth at the bank was dubious so we moored with the bow pulled tight in and the stern sticking out - a little unconventional, but we did not expect too much passing traffic in the night, which was fortunately still and fine.